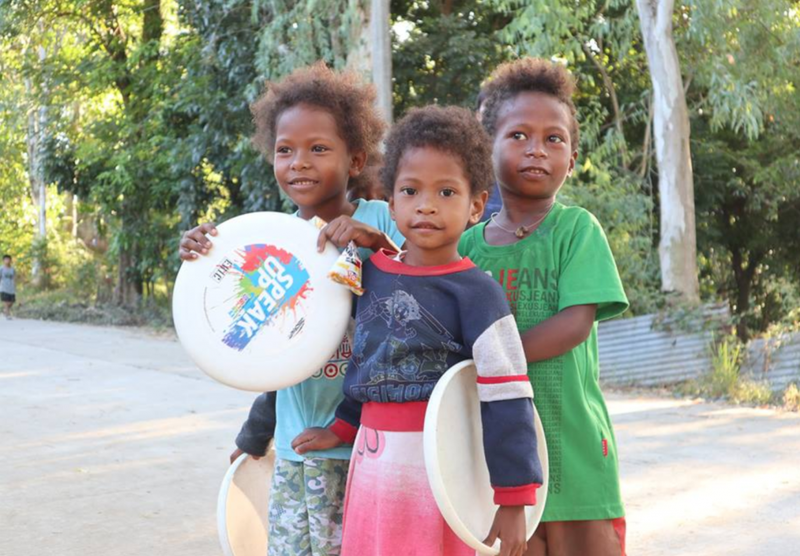 tribe in the Philippines — with E.R.I.C. discs. Photo: Donnie Marie Pogoy. This article is sponsored by Early Recognition Is Critical (E.R.I.C.) and was written by Jansie Santos of E.R.I.C. Nonprofit organization Early Recognition Is Critical (E.R.I.C.) ushered in the new year with a big change — the transfer of leadership from co-founder Jim Gerencser to one of E.R.I.C.’s volunteer coaches, John “Jolas” Larracas. Along with passing the proverbial torch, there are a number of exciting developments for the organization at the start of 2019, including a new logo, added pillars of advocacy, and a growing Advisory Council and team of ambassadors. E.R.I.C.’s brand new logo beautifully symbolizes the organization’s fresh, new direction. The colorful circle represents harmonious unity in an environment not divided by gender, ethnicity, religion, or belief. It circles around the original E.R.I.C. lettering to reinforce the nonprofit’s legacy as well as its evolution. When E.R.I.C. was founded in 2012 by friends Jim Gerencser and Cassandra Palo — both of whose lives were touched by cancer in the family — they recognized that in order to beat the disease, early recognition was key. Gerencser and Palo’s objective was to make E.R.I.C. a platform for early cancer detection and body awareness, using ultimate as its main vehicle for delivering their message, educating young people, and building community. Jolas Larracas, whose family has also been impacted by cancer, agrees with the importance of early detection and intends to continue E.R.I.C.’s legacy on this issue. The E.R.I.C. Speak Up campaign and clinics will continue to be one of the organization’s tools to help achieve its advocacy. Since its founding, E.R.I.C. has reached more than 200,000 youth in the U.S. and around the world, a testament to the success of the Speak Up campaign. E.R.I.C. aims to further expand on that legacy by including additional facets such as support for cancer-affected families, friends, and medical professionals; aide in research and facilities; and tapping cancer centers and partners. Larracas, along with E.R.I.C.’s Advisory Council and ambassadors, is now working on mobilizing new campaigns to expand the organization’s impact and, additionally, execute three new pillars of advocacy. The previous leadership of the organization operated around two pillars: early cancer detection and Spirit of the Game. Under the leadership of Larracas, E.R.I.C. will also work on three additional pillars: diversity, inclusiveness, and equity. Throughout the years, ultimate’s robust community spirit has helped E.R.I.C. serve its mission of advocating for early cancer detection and Spirit of the Game. Looking forward, the organization will explore other sports and events in order to reach a bigger and more diverse population. On top of the list of these new sports are climbing, running, and triathlons—sports with a strong community spirit. Another key element to the success of E.R.I.C. is its relationship with its brand partners. Jolas aims to further strengthen E.R.I.C.’s partnership with existing brands while on the lookout for more partners both in the U.S. and abroad; more support equals greater success. E.R.I.C. has thusfar operated and carried out its campaign in a significant number of countries including Australia, China, Colombia, Czech Republic, Finland, Germany, Italy, Latvia, Mexico, Poland, Slovenia, South Africa, and Venezuela. Starting this year, the aim is to extend this reach to as many countries as possible. “We have started discussion with passionate individuals in ultimate communities across the globe. The dream is to have an ambassador and council member/s in each continent whose responsibilities include researching and reporting cause-relevant issues so we can brainstorm and implement campaigns to address these as pertinent to our pillars of advocacy. We are excited to introduce our growing dream team once we complete our lineup,” Jolas Larracas shares. Comments on "Early Recognition Is Critical (E.R.I.C.) Forges Ahead with a Fresh, New Direction"